Less controversial was the appointment of Michael Benson to the taxicab board. That body had been unable to meet because it had only two voting members out of five, and could not achieve a quorum. If all three members show up now, that body can hold its meeting. The Aug. 20 council agenda included a resolution to place a public art millage on the Nov. 6 ballot for Ann Arbor voters. A second related resolution dealt with the existing Percent for Art program. The possibility of placing a ballot question in front of voters this November had first been revealed at the council’s Aug. 9, 2012 meeting, when Christopher Taylor (Ward 3) added the item to the agenda at the start of that meeting. The millage that voters will be asked to approve will be levied at a rate of 0.1 mills, which will generate around $450,000 annually. For the owner of a house worth $200,000 the tax will cost around $10 a year. Approval by voters on Nov. 6 would mean that the funding mechanism already provided by Ann Arbor’s Percent for Art ordinance would be suspended for a period of four years – the duration of the millage. That program, in place since 2007, requires that 1% of all city capital projects be set aside for public art, up to a limit of $250,000 per capital project. The source of funding – city capital projects – has legal implications, requiring that the funded artwork be “monumental” or permanent-type works. The public art funds from a millage would not necessarily be restricted to such permanent art, as the current Percent for Art funds are. The additional flexibility afforded by a millage-based public art program might include the ability to fund performance art, for example. The arts community and others voiced several concerns about placing the item on the Nov. 6 ballot. Those concerns include a lack of clarity for voters about how yes or no votes would impact public funding for art, the short timeframe during which a millage campaign could be mounted, and the fact that Ann Arbor voters will already be asked to vote for two other millages on the Nov. 6 ballot. Those two millages are: (1) a renewal of a 1.1 mill tax to pay for park capital improvements and maintenance; and (2) a library millage to support construction of a new downtown branch of the Ann Arbor District Library – expected to cost 0.56 mills in its first of 30 years, but averaging 0.47 mills. Shall the Charter be amended to limit sources of funding for art in public places and to authorize a new tax of up to one-tenth (0.10) of a mill for 2013 through 2016 to fund art in public places, which 0.10 mill will raise in the first year of levy the estimated revenue of $459,273? SECTION 8.24. In addition to any other amount which the City is authorized to raise by general tax upon the real and personal property by this Charter or any other provision of law, the City shall, in 2013 through 2016, annually levy a tax of up to one-tenth (0.10) of a mill on all taxable real and personal property situated within the City for the purpose of providing funds for art in public places, including but not limited to the permanent and temporary acquisition, maintenance and repair of works of art for display in or on public structures or sites and/or as part of or adjacent to public streets and sidewalks, and performance art on city streets, sidewalks or sites. Except for funds previously raised, set aside, allocated or otherwise designated to be used for public art, including such funds in the July 1, 2012 to June 30, 2013 fiscal year budget, and except for funds that are received by grant, gift, bequest or other donation to the City for public art, for the duration of this millage, the City shall not raise, set aside or designate funds for public art in any other manner. This millage also shall not preclude the grant, gift, bequest or other donation to the City of works of art. A separate resolution concerning the existing Percent for Art program was also on the council’s agenda. It was meant, according to its sponsor Jane Lumm (Ward 2), to provide clarity to voters about what their vote on a public art millage would mean for the future funding of public art. Lumm’s resolution directed city staff to prepare an ordinance revision to the Percent for Art program, with the idea of repealing the current funding program before the millage vote. The idea is that voters would understand clearly that unless the public art millage is approved, no public funding for art would remain. Eight people spoke on the topic during public commentary. Thomas Partridge introduced himself as a Democrat from the city of Ann Arbor and Washtenaw County – an advocate for public transportation and access to health care, including free health care for middle class and low-income people to be provided by the University of Michigan hospital. It’s important to take a universal and integrated approach to funding public art and affordable housing and truly affordable transportation. On the subject of public art, he said, in a city known for its prominent educational institutions – like the University of Michigan, Eastern Michigan University and Concordia University – we need to have public art education instead of extraordinary amounts spent on public art. Collins reported that his colleague Ken Fischer, president of the University Musical Society, is actually quite opposed to the millage for that reason. Collins told the council that he felt the Percent for Art is a good way to fund this type of program – art in public places funded with public money. A lot of communities support that approach and make it work, Collins said, and it could be made to work in Ann Arbor too. If the council chooses to put this on the ballot as a millage, Collins said, it’s very important to the Michigan Theater and every institution that doesn’t provide art in public places, that the millage is very narrow. Meg Crawley told the council that she’d never spoken to them before but she was there to advocate for public funding for public art – because she thinks it’s important. She’s lived in Ann Arbor for 40 years. She’s the neighborhood representative for a mural project at Allmendinger Park, she said, which would be completed in the next few weeks. The mural is being constructed by Ann Arbor artist Mary Thiefels, and she’s including artifacts from the community in her mural. Crawley has volunteered to help by collecting the items and logging them into a spreadsheet. Over 50 families had participated, she said. The process has brought home to her how much the community treasures art and its connection to parks. Allmendinger Park is showcased each fall when the University of Michigan football fans park in the neighborhood. The art project will draw people to it, and show them the true heart of Ann Arbor. The project has had an energizing effect on the neighborhood, she said. It’ll be free for anyone who wants to see it, she noted. The mural would facilitate pride in our community. She asked the council to find any way they can to keep public funding for art in the future. Parker noted that the Percent for Art program works with one part-time administrator and a revolving band of nine volunteers who serve on the commission. Before the program, there was no permanent art being made in the city, she said. If the council wants to change the funding mechanism, Parker said, it’s important to be sure to use what we’ve learned over the last five years: how to work with city departments; how to connect with the long-term city planning system; how to use the city information and communication technology; how to work with the art administrator; how to keep the city council informed; and how to keep public informed. She allowed that the public art commission might not be successful at all those things, but one thing is sure, she contended: Before the Percent for Art program, no one knew how public art was done. It’s true that the Percent for Art funding mechanism is complex, and can be restrictive. But learning how to work with the city was by far the hardest part of the start-up, she said. She invited people to stand in front of the mosaic wall on Washington Street, or the Plymouth Road water tower or the new city hall, and then to shut their eyes, and to imagine the scene without any art. She asked them to then open their eyes and to contemplate whether those scenes were better with or without art. 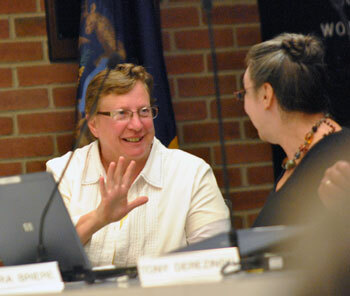 Marsha Chamberlin addressed the council as chair of Ann Arbor’s public art commission (AAPAC). She said that one thing the group does not want is for funding for art to disappear. The resolution as proposed gives more flexibility in the implementation of the public art program, she said, and gives some real opportunity for “rapid innovation,” which she felt would be a positive thing for Ann Arbor citizens. Marsha Chamberlin, chair of the Ann Arbor public art commission, sat in the audience before the Aug. 20 city council meeting started. Chamberlin also serves as president of the nonprofit Ann Arbor Art Center. The funding for public art – art performed or temporarily installed in public places – will expand what AAPAC can do as a commission, Chamberlin said. When the Dreiseitl sculpture was dedicated, she said, the international quality of the city was talked about – the thousands and thousands of visitors who come to Ann Arbor. Public art is part of what makes the city a great place and lends a quality of life that she wanted to make sure is sustained in the city. At the end of September, she said, the mural in Allmendinger Park – which Meg Crawley had described – will be celebrated. It will be another great example of a completed piece, she said. She invited the council to join that celebration and to celebrate another victory for the city of Ann Arbor. Debra Polich introduced herself as a resident, a 30-year arts administration veteran, and director of the Arts Alliance. The alliance advocates for the creative sector of Washtenaw County, she said. The alliance facilitates the Cultural Leaders Forum, which monthly brings together leaders from Ann Arbor’s largest cultural institutions. Over the last 10 days, more than 50 of them have expressed their opinion about the millage. Almost all of them are supportive of the concept, but greatly concerned about the timing. Based on surveys, Ann Arbor places a high value on arts and culture. Public funding approved in a millage would reflect the high value that residents put on arts and cultural offerings – in a way that public funding for parks and libraries and transportation reflect the high value that residents place on those services. Polich told the council that experienced advisors had suggested to the arts alliance that in order to do any arts millage properly, it would take 12-18 months of due diligence. It might be expedited to a minimum of six months, she said. [It's roughly a three-month span from the time that Christopher Taylor first unveiled the proposal publicly (Aug. 9) until the Nov. 6 vote.] That time can be used to engage the community, and build consensus. Work should include polling the community, and if favorable, setting the millage at the right level, she said. The advisors to the Arts Alliance had also recommended talking to community leaders, in order to expose support and opposition. The Arts Alliance absolutely supports the public funding of art, Polich said, and appreciates Taylor’s millage proposal. But as appreciative as the Arts Alliance is of the suggestion, she added, the short timeframe is of concern. She called Jane Lumm’s resolution that would lead to the elimination of Percent for Art funding prior to a millage equally premature. The alliance recommends not approving either proposal now. Instead, she said, she would ask that the Arts Alliance, the public art commission and others work together to improve the functioning of the Percent for Art program. John Kotarski introduced himself as a member of the public art commission. He supported placing the millage on the ballot on Nov. 6. He said he’d served on the commission just since January 2012, but that he could already say that the restrictions imposed by the current funding arrangement have been a major roadblock to funding the types of projects that are near and dear to Ann Arbor. Delaying the millage vote would confuse voters, he cautioned. A millage-funded program would make the program stronger and more accountable. Kotarski said that those who fear that the millage won’t pass are underestimating the leadership ability of councilmembers. If every councilmember wants the millage to pass, he contended, then it will pass. John Carver told the council he was there to support the Percent for Art ordinance. He’s involved with several groups of private entrepreneurial types, who are trying to do some things that could make Ann Arbor more vital and interesting. The Percent for Art had gotten the ball rolling, he contended. There’s a group that is trying to bring more live music to Ann Arbor, patterned after a program in Austin, Texas. Another group is trying to enhance the architectural lighting in the theater district – and they’ve had meetings with representatives of McKinley Inc. and the Michigan Theater. Carver also told the council that he’s involved in a group called the Wolfpack on the RiverUp! project. That project involves upgrading amenities along the Huron River – and Carver reported that the Superior Portage is completed. Gallup Pond and Island Park will also be a part of the project. He stressed that the effort involved only private funds. He told the council that he owns the building downtown at 500 E. Liberty, which he said is in the theater district. He had commissioned an artist to do a sculpture on the building. It would be called the Spirit of Ann Arbor and would be created by the artist Charles McGee, a World War II veteran. Sandi Smith (Ward 1), who serves on the board of the Ann Arbor Downtown Development Authority with Russ Collins, led off the city council deliberations with an amendment that took a suggestion made by Collins during public commentary: to change “public art” to “art in public places” throughout the ballot question and charter amendment. She wanted to make sure that people did not mistakenly think that passage of the millage meant that they no longer needed to make their membership payments to The Ark or the Michigan Theater or other similar organizations. Sabra Briere (Ward 1) greeted meeting attendees, assuring them that she was certain the council would definitely take the action of approving the minutes of the previous meeting. Smith’s wardmate Sabra Briere floated the idea that the change be considered “friendly” and could be adopted without a vote. Christopher Taylor (Ward 3) was himself amenable to the idea, but worried that the language of the existing proposal had already been reviewed by the state attorney general on a preliminary basis. 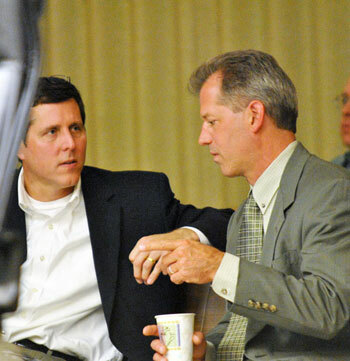 City attorney Stephen Postema ventured that he did not think the attorney general would have a problem with the change. So the “friendly” amendment was adopted. Taylor noted that the purpose of offering the resolution at the council’s previous meeting was to initiate public conversation. That mission has been accomplished, he declared. The public art commission has met [in a special session on Aug. 15, due to the unexpected nature of Taylor's proposal] and other arts groups have met and discussed the issue. Taylor said he’d received a tremendous amount of feedback. It’s clear that Ann Arbor really values art in public places, he contended, and they see it as something that warrants government support. In his view, a millage is the best way for that government support to be realized, so he’s eager to have that question put to voters. Those in the arts community have questioned whether it’s an opportune time for the millage, and he shares that concern. There are a number of particularities about why this is not the best time for a millage. He is not yet convinced, so he’s eager to hear what his colleagues think. He then ticked through the specific concerns: whether it’s the proper cycle; the lack of polling; the inchoate nature of funding; high costs of promotional materials; potential for misunderstanding as to scope. Many of those things are true, Taylor admitted, but he was not sure they pushed him over the edge. He felt that the benefits and detriments are a “gut check” for people. He stated that “we all want it to succeed,” and stated that he is confident it will succeed in any election – so he’s not certain it wouldn’t be best to ask the most people about it. [This was an allusion to the fact that it falls in a presidential election cycle.] 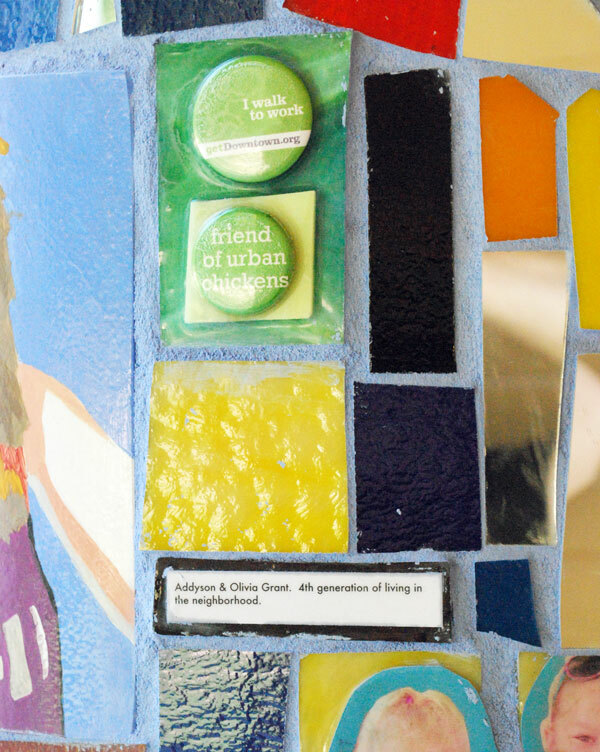 He felt that Ann Arbor at its core is a community that will support art in public places. However, he stated that he was “still up in the air” and was eager to hear the thoughts of his colleagues. Stephen Kunselman (Ward 3) said he had “jumped on this” as soon as Taylor had initiated it. [He asked to have his name added as a sponsor.] He ventured that everyone knows he’s been very vocal in criticizing the existing funding mechanism. The community has been debating the funding ordinance, and no other community in Michigan has adopted the same kind of ordinance. That indicated to him that no other city is willing to stick its neck out and take money out of utilities and special millages to pay for art in public places. “A millage is the only way to go,” Kunselman said. He appreciated the comments from people in the arts community who were hesitant to see the millage placed on this November’s ballot. Kunselman looked at art as being something that needs to get out in front of the most voters, in order to give it a chance of passing. 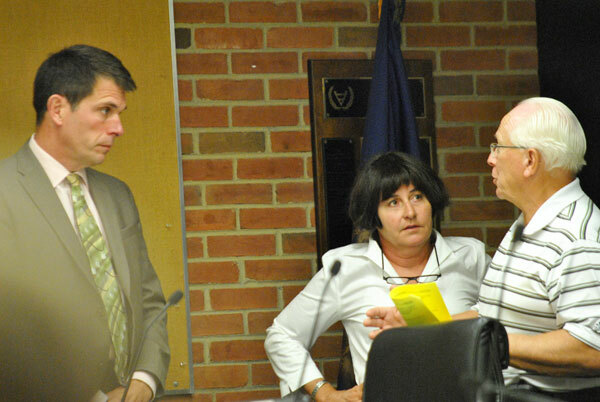 From left: Carsten Hohnke (Ward 5) chats with Stephen Kunselman (Ward 3) and Ann Arbor art commission chair Marsha Chamberlin after the vote to put a public art millage on the Nov. 6 ballot. Kunselman liked the idea that it will “unchain the restrictions” so that not just monumental art but also cultural arts can be supported. He said he came from a cultural arts family – pointing out that he’d at one time worked as a projectionist at Michigan Theater. Responding to the short timeframe for mounting a millage campaign, Smith noted that she’d twice been involved in bringing forward a proposal to roll back the Percent for Art program to a half percent. That was not because she’s not a fan of art, she said. On both occasions, in a very short period of time, the arts community and the broader community had come out and convinced her that’s reducing the percentage to a half percent is not the way to go. So she was not concerned about the arts community not having that kind of energy when it comes to voting in November. She felt that “we’re a passionate and creative bunch and recognize a good thing.” She said she’s looking forward to living in a city that has parks and a new library when a lot of cities are still struggling. In contrast, Ann Arbor is not just moving forward, but rather “surging” forward. Now is as good a time as any to do it, and she would do her part to make sure people know that they should vote yes on the millage. Tony Derezinski (Ward 2) distinguished between the politics and substance of the issue. The substance has been discussed frequently, and frequently it’s been upheld, he said. The community has supported the Percent for Art ordinance, even with its imperfections, he contended. The millage proposal is better, he said, because it eliminates some of those restrictions associated with the Percent for Art program. It’s a pleasure to agree with Kunselman on something, Derezinski said. On the issue of the timing, he said “we don’t live in an ideal world.” He felt it was important to go ahead and put in on the ballot. He thinks the community support is there, and he would vote to put it on the ballot right away. Mike Anglin (Ward 5) said he’s always supported the Percent for Art program. He’s had problems with how it was funded, he allowed. But he thanked the members of the public art commission for their service. He said that this change to a millage-based proposal would allow performance art on city streets and sidewalks. He felt that a millage would be a fair way to approach it – given that it was for a relatively short period and could be evaluated at the end of four years. Jane Lumm (Ward 2) indicated that based on what she was hearing at that point, it didn’t sound like the council was inclined to postpone. She reviewed the various concerns that had been aired at a cultural leaders forum held by the Arts Alliance earlier that day – a gathering that she, Derezinski, Taylor and Hieftje had attended. She noted that there were basic questions – about the amount of the millage, for example. She lamented the fact that Taylor’s proposal does not offer residents a clear choice about whether to use public money to pay for art. She felt there should be a clear choice. She indicated she would support placing the question on the ballot, based on her commitment to offer voters a clear choice – with her subsequent proposal to prepare to eliminate the Percent for Art funding mechanism prior to the millage. Sabra Briere (Ward 1) allowed that she’d been more of a critic of the Percent for Art program than a supporter. But unlike Kunselman, she did not oppose it on the grounds that it involves capital improvement dollars. She thinks that the program has started out with a lot of money and with no guidance about how to spend that money. Based on her own observations at AAPAC meetings, it continues to be a struggle to spend the money. She said the amount Ann Arbor sets aside is inordinately large – based on conversations she’s had with art administrators in other cities. Briere said her issue is the definition of capital improvements. She viewed the ballot proposal with favor. She felt that the inherent restrictions in the existing Percent for Art program have been more onerous than effective. The fact that the amount to be generated by the millage is more than the money already being set aside bothers her. If the commission is given more dollars to spend, it’ll be difficult to balance all the demand – but at least the commission will have the ability to spend some of it on things other than monumental art. She’s not concerned about the short timeframe of the next two months, saying that the conversation has been going on for the last five years. Respondents to her informal poll over the weekend were as likely to say they support the current Percent for Art program as they were to say they oppose all dollars going to a millage. If councilmembers are going to do this, she said, they have sell it. They have to be confident as they communicate to the public that the council is not trying to hedge its bets too much. That is, if the public goes ahead with the millage, it means that the council needs to re-examine the Percent for Art program and change the way it reads on the books. Carsten Hohnke (Ward 5) asked for some confirmation about the impact of the millage passage: If the millage passes, then the funding specified in the city’s Percent for Art ordinance would be suspended. Assistant city attorney Abigail Elias pointed Hohnke to the language of the charter amendment, which prohibits using city funds from any other means than the millage for the duration of the four-year period. Left to right: Christopher Taylor (Ward 3) chats with Carsten Hohnke (Ward 5) during a recess in the meeting. In the foreground is Jane Lumm (Ward 2). Hohnke offered a different perspective. He contended it was his experience that the majority of people in Ward 5 and throughout the city think that “Percent for Art is great!” He claimed that it’s been solidly supported by a vast majority of constituents, when revisions have come before the council. He thinks that additional funding for arts that addresses constraints of the Percent for Art program is a great thing. He appreciated the effort to find a way to support other types of art. His view is that the folks in the city would support both. He is a little concerned that people want to see the funding mechanism replaced. He then proposed an amendment to the ballot proposal that would eliminate the part that suspends the Percent for Art funding for the duration of the millage. Hohnke thinks both funding mechanisms should be available, and he’s concerned about constraining future councils. If the public wants to pass this millage, then the council could also modify the Percent for Art ordinance at the council table. He felt there are two separate questions: Percent for Art funding, and millage funding for a set of art that is less constrained by the current program. It’s not just different funding mechanisms, Hohnke said. The Percent for Art program involves the way the city impacts the built environment. When we choose, as a community, to make capital expenditures, we’re saying that we want art to be a part of how we’re impacting our built environment, he said. He felt that’s important and that it has been effective in many communities around the country. Briere called Hohnke’s idea “an interesting approach.” Her perception is that it’s been difficult to spend the money that’s already been allocated. She ventured that if both propositions went forward, the public art commission would suddenly have $860,000 to spend, which is quite a lot – especially because it’s not been easy to deal with half that amount. So Briere asked Hohnke if that’s what he intended. Hohnke confirmed that was his intent, and allowed that she’d made a good point. He called the challenge one of process. And he contended that process challenges are not beyond our means to address, because we have energetic, smart people working on it. Derezinski feared that Hohnke’s proposal “might very well kill it.” Given the short timeframe, you have to be careful about how to sell it, and be careful not to ask for too much, he said. He couldn’t go along with Hohnke’s idea. Smith respected Hohnke’s feeling behind the amendment. But she’d rather vote down the proposal and come back with more tightly crafted language and wait for next ballot than to pursue Hohnke’s amendment. She felt that it risked losing it all. Anglin was not in favor of the amendment, and indicated he was inclined to see how well the millage proposal worked out. Kunselman said he couldn’t support Hohnke’s amendment, but picked up on a reference Hohnke had made to Percent for Art-type programs outside the state of Michigan. He felt that in Michigan, the Percent for Art approach doesn’t have a legal basis. Kunselman pointed out that the council had voted down directing the city attorney to produce an opinion. Kunselman felt a lawsuit could strike down the city’s ordinance. Hohnke allowed that he could not give a specific example of another city in Michigan that had a Percent for Art program. But he argued that other Michigan cities also don’t fund human services in the same way that Ann Arbor does. Hohnke doesn’t see any problem with Ann Arbor “taking leadership.” Despite Kunselman’s concerns about a lawsuit, Hohnke pointed out that no lawsuit had yet been filed. He claimed that the city council had an assurance from the city attorney that the city’s Percent for Art program is a perfectly appropriate way to fund public art. Mayor John Hieftje said he wouldn’t support Hohnke’s amendment, but appreciated how zealous Hohnke was. Jane Lumm (Ward 2) also said she wouldn’t support it. She felt it would be hard to sell. She echoed Briere’s concerns about the sheer amount of money that would be involved. She described being lost in Philadelphia recently, which has a Percent for Art program. She described a long stretch of blight, but then in the downtown you see some nice pieces of art, she said. She referred to Maslow’s hierarchy of needs [the implication being that basic needs like food, water and shelter should be satisfied before higher needs, like self-actualization.] She responded to the several claims around the table that the Percent for Art program is solidly supported, but noted that residents have not had a chance to vote on it. Outcome on Hohnke’s amendment: Hohnke was the only voice of support. Marcia Higgins (Ward 4) appeared only inadvertently to vote for it. Mayor John Hieftje said he’d support putting the proposal on the ballot. He was happy it’ll have widespread support. He felt that it’s rightly a four-year millage. Next time around, the council would be able to reduce the amount of the millage or add more to the amount that is put before voters. Hieftje made a standard economic development argument for public art, saying that having public art in your city creates excitement and that excitement can cause people to want to be in the place and make people think that this is a great place to be. 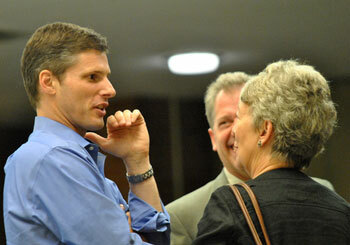 Carsten Hohnke (Ward 5) indicated he’d support the proposal, despite the failure of his amendment. With respect to “performance art,” Marcia Higgins (Ward 4) asked if the Ann Arbor Summer Festival could be supported by the millage. Assistant city attorney Abigail Elias indicated that “performance art” is a well-known term of art in the arts community. She said it’s pretty flexible, but excludes something like a theater performance. A performance at a venue like a theater isn’t performance art. She was not able to say whether something like a performance in an outdoor setting like the Summer Festival would be performance art or not. Outcome: The council voted unanimously to place a public art millage on the Nov. 6 ballot. Public Art Millage: Beginning Ordinance Repeal? Jane Lumm (Ward 2) pitched her proposal later in the meeting. It would direct the city’s legal staff to prepare of a repeal to the existing funding mechanism of the Percent for Art program. She related to her council colleagues how she’d told the meeting of cultural leaders earlier in the day, that she would withdraw the proposal, if the millage proposal were postponed [as president of the Arts Alliance, Deb Polich, had asked the council to do]. Lumm said the ordinance has been controversial from the beginning, and she felt the time to reexamine it is now – by asking voters the fundamental question of whether they support public funding of art, rather than simply which method. Jane Lumm (Ward 2) and Christopher Taylor (Ward 3). The approach of asking voters to support a millage, with the existing program as a default, says to voters: We’re going to use public funds for art regardless, but we’d sure like your input about what method. She felt that it’s important to ask the basic question of whether citizens support public funding of art. By repealing the existing Percent for Art ordinance before the November election, voters would get that clear choice. She said she trusts the voters, regardless of the outcome. She did not want to set up a “have your cake and eat it, too” situation where voters are given a Hobson’s Choice. Sandi Smith (Ward 1) said the first time she read through Lumm’s resolution, she got out her virtual red pen because she wanted to cross out various “whereas” clauses, saying that they were “unnecessarily inflammatory” about a program that is just finding its legs and “demeaning” to volunteers on the public art commission who’ve spent a significant amount of time of this program. She called the “whereas” clauses “judgmental” with respect to the commission’s progress. Rather than trying to revise the “whereas” clauses, she said she’d simply opt to reject it. Stephen Kunselman (Ward 3) indicated he’d support the resolution, noting it just directs staff to prepare a resolution to change an ordinance – something for the council to digest at a later meeting. He doesn’t want to terminate the entire ordinance, but rather some of the funding mechanisms for it. The charter millage language only suspends the funding mechanism, but doesn’t resolve it. He ventured that the council would be dancing around the issue for a time – until we get greater community consensus about funding of public art. He also wants to see language prepared in case the millage does fail. The resolution would get the council to start thinking. Sabra Briere (Ward 1) respected the idea of the proposed resolution and the intent that councilmembers Lumm and Kunselman brought to it. If the Percent for Art funding mechanism is repealed, then if the millage were to fail, there would be no public funding for art. Even though the council had reviewed the possibility of reducing the funding for the existing Percent for Art program on several occasions before, she noted that no one had ever proposed to eliminate it altogether. Briere said that if the council weren’t putting a millage on the ballot, she would not even flirt with the idea of Lumm’s resolution. She’s happy to wait, she said, and see where we are after the millage vote. 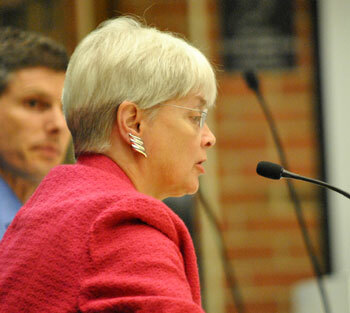 The idea of being prepared for the millage to be defeated and the need to address the Percent for Art program is one she thinks is worth remembering. But she didn’t think she could support this resolution. Mike Anglin (Ward 5) viewed Lumm’s resolution as supportive of the millage. He didn’t read it as negative, but rather as going through the pitfalls of the current program, which the public art commission itself has brought to the council. The resolution simply says that the city is going to put aside what they’ve used before. By way of additional background, it’s likely that Smith and Derezinski were not reacting specifically to the “whereas” clauses, which are difficult to see as demeaning to the public art commission. Instead, they were likely reacting to the memo attached to the resolution, which refers to “The slow launch of the program, accumulated, unused surpluses at a challenging fiscal time for the city, and projects not universally accepted” – statements that might be seen as laying blame on the public art commission. Lumm rounded out her remarks by ticking through the various interpretations that yes and no votes for the millage might have. She reported that other councilmembers at the meeting earlier in the day with cultural arts leaders had acknowledged that voter sentiment would be difficult to read. 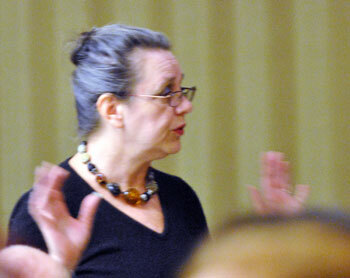 Left to right: Sandi Smith (Ward 1) tells Sabra Briere (Ward 1) how many minutes Jane Lumm had been speaking – five. Councilmembers are supposed to be limited to two speaking turns on any given question, the first of which has a limit of five minutes and the second three minutes. Lumm’s turn ended when Smith raised a point of order – that Lumm had exceeded the time limit on her speaking turn. Carsten Hohnke (Ward 5) came back to the issue of the “whereas” clauses, saying he felt the clauses make bold assertions that he claimed are only weakly supported. As an example, he gave ” … many Ann Arbor residents believe the allocation of capital project funds to public art represents an inappropriate and unrelated use of dollars.” He dismissed that assertion by saying, “Many Ann Arbor residents believe yada yada yada. Many Ann Arbor residents believe a whole bunch of things and you can insert whatever you want.” He contended that the evidence is to the contrary. In the repeated conversations the council has had, he continued, the council had heard overwhelming support for the public art program. So he felt the statement was not an accurate reflection of the facts. Hohnke then took up the statement in the “whereas” clauses that “Voters were never provided the opportunity to have their voices heard …” Hohnke ventured that what that statement meant was that voters had not had a chance to vote directly on the issue, and he admitted that was true. But he claimed that it’s inappropriate to say that their voices haven’t been heard. It had been thoroughly debated when the ordinance was enacted, he contended, and people’s voices were heard. The Arts Alliance was very rigorous in seeking out the opinions of councilmembers and making them widely known, he said, so that people had a clear understanding of where their councilmembers stood on the Percent for Art program. Ultimately, though, Hohnke felt that the resolution was unnecessary. He noted that councilmembers can simply ask staff to prepare a resolution. He claimed that the controversy that Lumm and Kunselman talk about surrounding the program is one that they and a small number of folks are manufacturing. There are significant and honest questions about the funding mechanism, he said, not the existence of support for public art. Public art is something that we don’t want to leave unsupported, Hohnke said. Mayor John Hieftje said he’d have a hard time supporting the resolution. He described the “preamble” as resembling more a political document than a resolution. Mike Anglin (Ward 5) introduced some confusion by appearing to indicate that Lumm’s resolution would continue the Percent for Art funding, even if the millage failed. Briere indicated that her expectation would be that Lumm’s resolution was meant to revoke the Percent for Art funding mechanism before hearing from voters. Kunselman suggested striking all but the final “whereas” clause so that the council would not have to “dicker” about it. Lumm was fine with that. The deletion of the “whereas” clauses did not change anyone’s mind. Outcome: The resolution to prepare for the repeal of the Percent for Art funding mechanism failed, with support only from Mike Anglin (Ward 5), Jane Lumm (Ward 2) and Stephen Kunselman (Ward 3). In front of the council was a resolution to start a process to change the current PUD (planned unit development) zoning on the former St. Nicholas Church property on North Main Street. The land is being put up for public auction on Sept. 6, 2012. The resolution indicated that the proposed new zoning would match the surrounding land, which is D2 (downtown interface). Downtown Ann Arbor zoning designations. Color key: blue, D1 (downtown); green, D2 (downtown interface), red, PUD (planned unit development). Kunselman’s Aug. 20 resolution would direct city staff to begin a process for rezoning The Gallery PUD to D2 (downtown interface), to be consistent with surrounding properties. The property has an easement on it held by its neighbor to the south, McKinley Inc., for 57 parking spaces, which poses a challenge for future development. 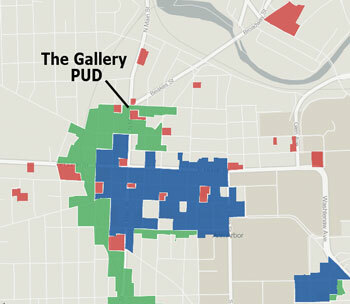 Authorized by the city council in 2006, the PUD zoning was intended to allow construction of The Gallery, an 11-story building (158 feet tall) that would include 224 parking spaces and 123 units of residential housing. Of those units, 18 would have met the definition of affordable housing derived by a formula based on area median incomes. In contrast, the D2 zoning has a height limit of 60 feet. If the property does not sell at the Sept. 6 auction (which concludes on Sept. 11), the property will be offered again for auction in October. If it does not sell after the second auction, it will revert to the city. Assistant city attorney Kevin McDonald explained at the Aug. 20 council meeting that in any case it would not be possible to complete the rezoning process before the first or the second auctions – due to the noticing requirement for all the relevant public hearings. The sponsor of the resolution, Stephen Kunselman (Ward 3), reviewed the basic history of the four parcels in question. Because the property is currently in public hands, he felt there was very low risk that the downzoning from PUD to D2 could be analyzed as a “taking.” In his conversations with Washtenaw County treasurer Catherine McClary, who’s technically the current owner, she had indicated to him that she didn’t have a problem with the rezoning. When The Gallery had come through the pipeline, Kunselman recalled that he’d served on the city planning commission at the time. He reviewed the details of that project, including the easement of 57 parking spaces that is now permanently attached to the land. The D2 zoning, which was put in place after The Gallery was approved, Kunselman said, is a fair statement of how the character of the Kerrytown neighborhood should move forward. Kunselman felt that the city is going to end up owning the land unwillingly. Assistant city attorney Kevin McDonald arrives at the meeting. Sabra Briere (Ward 1) asked assistant city attorney Kevin McDonald to the podium to talk about the timetable for rezoning compared to the planned auction on Sept. 6 and the possible second auction in October. McDonald told the council that the city wouldn’t be able to rezone the property before the first or the second auction, given the amount of public notice that is required: “There is simply not time to do it,” McDonald explained. Briere wanted to know what the effect of the resolution would be on the ability of the county treasurer to sell the land. McDonald said that any answer he gave would be speculation. McDonald noted that the county treasurer has a view and staff has a view. One of the constraints on the property is the 57 parking spaces that have to be provided to the neighbor. And any project has to incorporate those 57 spaces. So if you don’t have a project of some density, there’d probably be no way to recoup the costs of building it, he ventured. The 57 spaces were built into The Gallery project, he pointed out. He felt there was some belief that if somebody bid at first auction, that might allow the prospect of building The Gallery. But anecdotally, he reported hearing from developers that the numbers just don’t work. There’s also an affordable housing component to the PUD zoning, so 15% of the units would have to be affordable, he pointed out. It’s hard to predict, and everyone has a different view on this, McDonald concluded. Briere was concerned that some prospective buyer might feel the city had changed the rules by discussing rezoning. So she wanted to hear from McDonald what his interpretation was of the effect of the resolution. McDonald reported that in his conversations with the county treasurer, she’d been very helpful. For the first auction, she felt that keeping the zoning in place would enhance the value of the property. If the council decides to pass the resolution at whatever time, what’s really important is simply that the city gives notice to any buyer that the rezoning process is in place, so that it could be put into someone’s evaluation of the property. The treasurer is willing to take whatever action and attach it to the due diligence documents for the auction. For example, the easement is already included. If the rezoning process were to begin, then a prospective buyer would have notice of that, if that’s what the council decided to do. It could affect someone’s view of the land’s value, he allowed, but the important thing is to clearly communicate council’s intention and desire. Christopher Taylor (Ward 3) characterized the 57 parking spaces as running with the land without regard to the zoning. He wondered if a rezoning, given the 57-parking space easement, would render it functionally un-developable. McDonald didn’t know that he’d say that. It’s a complex easement, he noted. The holder of the easement currently has no cost, and if construction of The Gallery takes place, then that’s when the payment for the parking begins. He said there’s no way to tell what’s going to happen at these auctions. If it doesn’t go at the first auction, there might be more speculative bids at the second auction. Kunselman observed that the 57 parking spaces would need to be provided, even if city ends up with the land. McDonald confirmed that, but said that the city could choose not to accept the land, in which case, it would go back to the county. 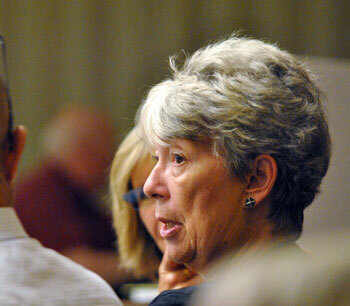 Sandi Smith (Ward 1) felt that the timing was off. She wanted to see how the process unfolds at the auction. It’s in the city’s best interest to see someone purchase the land, she said. She did not want to add to the already existing challenge of disposing city-owned land. She felt that “getting out of the way” is the best approach. Jane Lumm (Ward 2) agreed with Smith, and described the resolution as premature. Tony Derezinski (Ward 2) wondered if the process of rezoning would perhaps give the city additional flexibility. It wasn’t totally clear what Derezinski meant, and McDonald noted that the proposed D2 rezoning was more restrictive. At the end of the day, he said, it depends on whether you want to see something like The Gallery built there or not. Carsten Hohnke (Ward 5) felt the resolution was a little bit premature at this point. Outcome: The council voted down Kunselman’s resolution to initiate the rezoning of the North Main Street property. The resolution would have directed city administrator Steve Powers to evaluate the parcel at 350 S. Fifth for possible public or corporate use. If no such use were found, the resolution directed Powers to report back to the council with a timeline for the disposition of the property – based on state and city laws and policies. That parcel is also known as the Fifth and William parking lot, because it’s currently used as a surface parking lot in the city’s public parking system, or the old Y lot, because it’s the location of the former YMCA building. Left to right: City CFO Tom Crawford chats with Stephen Kunselman (Ward 3) during a recess of the Aug. 20 meeting. The resolution’s sponsor, Stephen Kunselman (Ward 3), has frequently raised the issue of ongoing interest payments associated with a loan used by the city to purchase the property from the YMCA for $3.5 million in 2003. The council voted in 2008 to extend the five-year loan with the Bank of Ann Arbor for another five years, through the end of 2013. The interest rate is 3.89%. The interest-only payments work out to roughly $140,000 a year. By 2013, the total interest paid will be around $1.4 million. When it was condemned, the cost of demolishing the old YMCA building and abating asbestos was around $1.5 million. The DDA covered the demolition costs and has covered half the interest payments. So the total amount of Ann Arbor governmental investment in the property is at least $6.4 million. The Connecting William Street project was undertaken by the DDA based on a directive from the city council, on a unanimous vote, given at its April 4, 2011 meeting. Kunselman voted for that planning effort to take place – but was also vocal at the time, as well as before, about his view that the old Y lot should simply be put up for sale one way or another. Stephen Kunselman (Ward 3), who sponsored the resolution, said it was intended to get the council to start thinking about what to do with the land. It addresses the $3.5 million balloon payment that’s due in December 2013. The interest-only payments will have accumulated to $1.36 million, he noted, which means that the city has $4.86 million in a piece of land that’s not worth it, he said. Kunselman said he knows that the Connecting William Street process includes the old Y lot, but pointed out that the planning effort is supposed to result in a presentation of a recommendation to the city council in late October. His resolution doesn’t have a timeframe per se, he noted, but just directs the city administrator to provide a timeline for disposition. He pointed out that the city hasn’t sold any land recently, and ventured that not many people on the city council had any idea of what the process for that is: Do we put a notice on the city website, saying “For Sale”? How would we get the best value, he wondered. Given that December 2013 is going to come up pretty quick, he felt that it’s important to start thinking about that now. Kunselman stated that the city had not had a lot of success with issuing RFPs (requests for proposals) in the past. And this particular property is costing the city a lot of money over time, Kunselman pointed out, while the other surface parking lots within the scope of the Connecting William Street study are not costing the city money. Sandi Smith (Ward 1) called the resolution premature and unnecessary. More than a year remains before the balloon payment is due, she pointed out, and there’s no reason, she felt, that the city would not be able to do another 5-year loan arrangement. She allowed that the city has not done the RFP process well in the past. That’s part of the Connecting William Street mission – to prepare the lots in a way that has full public buy-in and that is economically feasible for sale. It’s a matter of hitting that special target of what the citizens need and will demand out of the sale of public land, and what is actually sustainable and economically feasible to be built. Smith felt Kunselman’s resolution is unnecessary and sends a clear message that there’s no faith in the Connecting William Street process. She pointed out that half of the interest payments are being borne by the Ann Arbor Downtown Development Authority. She also pointed out that the city receives 17% gross revenues from the surface parking spaces now located on the old Y lot [as well as the rest of the public parking system]. By way of background, the Fifth & William parking lot generated $199,839 in revenues in fiscal year 2011. And 17% of that works out to $34,000, which is 25% of the total interest payment on the loan, or half of the city’s share of that payment. Smith allowed that lumped together, the total cost seems traumatic – and she said she’s not sure she’d have supported the purchase of the land in 2003. But she fully supports the process underway. Mayor John Hieftje described the group of citizens who are working hard on the Connecting William Street project, who will come back to the council with a report. Yet he appreciated Kunselman’s direction for action. Responding to Kunselman’s contention that the old Y lot is not worth as much as the city has invested in it, Hieftje ventured that if you look at recent comparables – like the property at South University and Forrest – the old Y lot has a lot of value. He acknowledged that the city might well just say here’s the zoning on the property, and just sell it. The city might turn to that approach, he said. His issue right now is the timing of the resolution. He was content to wait, but might support the resolution after the Connecting William Street report came back. Spotting an opportunity to win Hieftje’s support for the resolution, Kunselman asked him if he was suggesting a postponement until the council’s second meeting in October. Then the council could have both items on the agenda at the same time. Hieftje declined the gambit, by saying he felt it would take time to digest the DDA’s report, and he did not see a reason to postpone it for future consideration. He did respect the concept of just putting a property on the market. Jane Lumm (Ward 2) highlighted the fact that the resolution focuses on the administrator’s recommendation. She felt the intent is quite reasonable. She described it as “kickstarting” the process of thinking about the site. The property has been off the tax rolls for a decade, she noted. Lumm did not feel the resolution presupposes any outcome of the Connecting William Street process, and it’s not about excluding the DDA. Mike Anglin (Ward 5) also expressed his support of the resolution. Carsten Hohnke (Ward 5) indicated he felt the resolution was premature, so he couldn’t support it. Smith stressed that the goal of selling the property should not be simply to avoid paying interest on the loan. There’s a larger public policy issue at stake, she said. There’s a “juicier conversation” to be had than one about directing the city administrator – and she’d appreciate people raising the level of the conversation around the table. Lumm read aloud the resolved clause, saying she thought it was reasonable. Sabra Briere (Ward 1) felt that the council should allow the Connecting William Street process to play out without “shadowing” it. She appreciated Kunselman’s constant concern about the interest payments and the looming balloon payment. But she wanted to be able to dissect the DDA’s proposal without comparing it to the city administrator’s efforts. Christopher Taylor (Ward 3) noted that the city council had asked the DDA to take a good long look at the property. And in his view it would be “proper, prudent and polite” to wait for the DDA to conclude its work. Outcome: The resolution on the old Y lot failed, with support only from Mike Anglin (Ward 5), Jane Lumm (Ward 2) and Stephen Kunselman (Ward 3). A goal for the city’s financial services unit, which is listed out in the fiscal year 2013 budget book, is collaboration with Washtenaw County to centralize the administration of public towing. Parking on someone’s private property or having as excessive number of parking tickets are examples of this kind of situation. Left to right: City administrator Steve Powers, Jane Lumm (Ward 2) and Dennis Brewer, who owns two local towing companies. Currently, the city contracts with three different companies, in three districts of the city: Brewer’s Towing Inc., Sakstrup’s Towing, and Triangle Towing. But those contracts expire at the end of 2012. 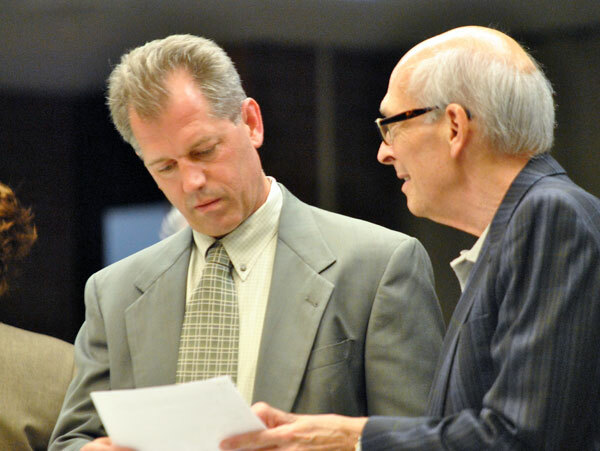 In front of the council was a resolution authorizing the city to contract with Washtenaw County, which will administer the towing under a single contract. The city will share responsibility for various aspects of the towing administration. On the city’s side, the existing manual, paper-based system will be replaced with one that uses CLEMIS (Courts and Law Enforcement Management Information System) and e-impound. The city will point to this collaboration with the county as part of the state’s economic vitality incentive program (EVIP), which encourages municipalities to demonstrate efforts at collaboration with each other. Dennis Brewer told the council that he and his wife own both Brewer’s Towing and Sakstrup’s Towing. He started Brewer’s back in 1963, he said. He’s opposed to the “suggestive language” in the resolution. He questioned how the first 8 hours of storage could be free? He ventured that this would be a real problem for customer relations. What if it turns out to be 8 hours 5 minutes – then people will object to paying, just because they were 5 minutes too late. He predicted it would be a real headache. When would the clock start ticking, Brewer wondered: When the tow company gets the call? When the tow company arrives on the scene? When the car reaches the storage facility? Brewer also told the council that his company’s computer system is based on calendar days for storage. The storage changes at 12:01 every day. Their current practice is that vehicles must be in storage at least 8 hours before a second day of storage can be charged. He reminded the council that it’s necessary to carry insurance to cover the cars in storage, and that the storage lots need personnel on duty 24/7 to release the vehicles. Stephen Kunselman (Ward 3) stressed that the primary issue is that it makes things more efficient as the two governmental units cooperate. He encouraged everyone’s support. Jane Lumm (Ward 2) asked the city CFO Tom Crawford to approach the podium. She called it a good collaborative effort, but noted that it differs from the previous approach in some details. She asked about “custom criteria” that could be applied – involving grace periods and the like. She noted that the council had heard from Brewer about the economic difficulty involved. Crawford explained that the two objectives were to reduce costs and improve service. The city and county are reducing their administrative fee from $60 to $45 – and the county will be sharing a portion of that $45 with the city. The city and the county also looked to the towing companies to help with those objectives. Some towing companies had a practice of starting the clock for the storage fee as soon as the car hit the lot. And at midnight, no matter what time the car hit the lot, the timer would click to a new day. Crawford allowed that some of the towing companies never had that custom. [Dennis Brewer, during his public commentary, explained that for his companies, the timer would not click to a new day unless the car had been on the lot for at least eight hours.] What the city wants to do for people who are quickly in and out, is to reduce the cost for those people. That might mean that the costs for those people who don’t pick up their cars within the first eight hours could increase. As it’s currently written, there’d be no fee for the first eight hours, Crawford explained. Washtenaw County sheriff Jerry Clayton was on hand at the Aug. 20 city council meeting to answer questions about the public towing contract. Lumm expressed concern that the towing companies have been doing this for a number of years – operating under a certain number of assumptions. She saw the attempts to make things more user-friendly as a good thing. She noted that some other councilmembers had questions about towing distance. She asked if the council would be able to weigh in. Crawford explained that the request for proposals (RFP) from the county would be going out soon, and he could take input from them that night. One of the criteria that they’ve received input on is one that measures the distance of a storage facility from the center of the city, defined as the intersection of Main and Huron streets, with additional consideration given to a facility’s location on a mass transportation line. Kunselman followed up on the question of how to ensure that a storage yard is on a mass transit line – he didn’t suppose the council would see the RFP before it went out. 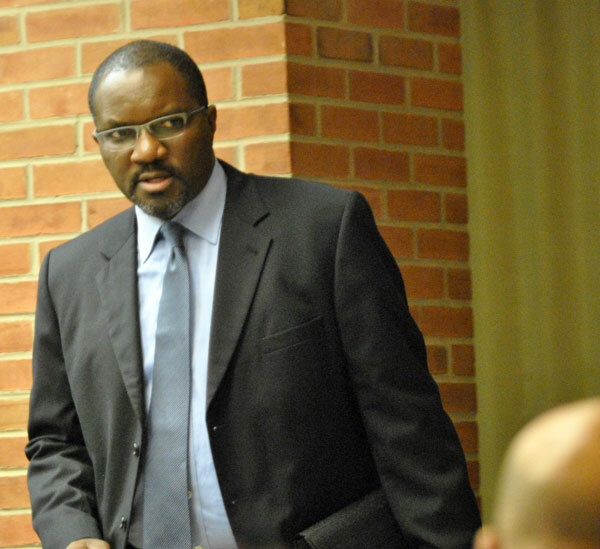 Crawford indicated that Washtenaw County would be issuing the RFP, but councilmembers could certainly see it if they wanted. Kunselman wanted to make sure that the city’s needs are being met with respect to the location of vehicle storage yards. Sheriff Jerry Clayton was on hand to explain that some criteria could be added to the evaluation process that relates to being located on a mass transit line. He didn’t see that as an obstacle that can’t be overcome. Lumm expressed appreciation for the hard work of staff, and said she felt that people who have their cars towed should pay the full cost of the service, but she appreciated efforts to lower the costs. Crawford stressed that the city and the county were working really well on this project. Outcome: The council unanimously authorized contracting with Washtenaw County for public towing. Ann Arbor’s municipal airport was back on the city council’s Aug. 20 agenda, possibly the last time for a long while to come. That was expected, based on action taken earlier this year in April. The first of two agenda items on Aug. 20 related to the fifth of five different grant contracts for the completion of an environmental assessment (EA) for a possible 800-foot extension of the runway. The $42,500 in the grant consists of $40,375 in federal funds, $1,062 in state funds and a local match of $1,063. A second airport-related item on the council’s agenda involved the use of those funds in the grant item to study the need to relocate federally owned navigational aids (ODAL lighting system) for the EA. However, when the Federal Aviation Administration responded to the EA draft report, that prompted communication between the city of Ann Arbor and the FAA in late 2011. And that back-and-forth has resulted in FAA requests for more work, which is meant to wrap up the environmental assessment. The most recent previous council action occurred on April 16, 2012, when the council considered several resolutions in connection with the airport, including the fourth EA grant contract. Andrew McGill addressed the council on behalf of a grass roots citizens group – on the topic of the environmental assessment (EA) study for the airport runway extension. If approved, he said, it would bring the total price of the EA to $400,000 – $100,000 more than what the council had been told 3.5 years ago, when it approved the original EA grant. The EA has become a “money pit,” for taxpayers – federal, state and local, he said. Part of the measure would pay the FAA to review the final EA, and his group did not have a problem with that. What McGill was concerned about was a provision in the grant regarding the navigational aids – or the approach lighting. He contended that this is not just a series in a long series of grants. Part the navigational aids study, he contended, would give the FAA a blank check from the city of Ann Arbor. A condition of that grant contract, he explained, is that Ann Arbor taxpayers must pay to move or replace the runway approach lighting, long into the future. Right now, he said, there’s no federal money for that, and he feared it could cost Ann Arbor taxpayers hundreds of thousands of dollars. That’s different from all the previous airport grants, he told the council. 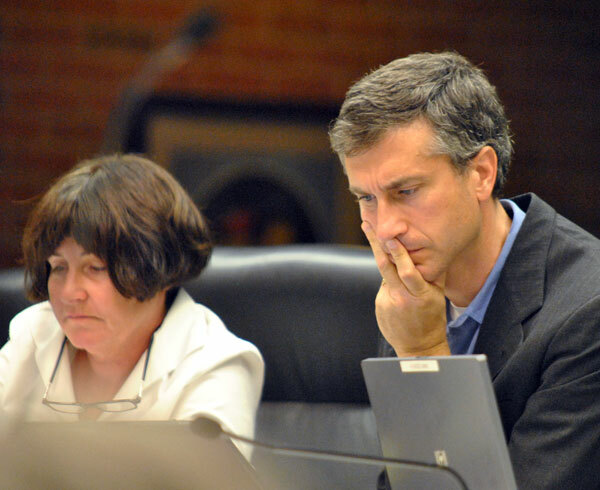 In light of McGill’s public commentary, councilmembers had a number of questions for Matt Kulhanek, the Ann Arbor municipal airport manager. They were essentially trying to get an assurance from Kulhanek that their vote for the two items would not expose the city to financial risk. 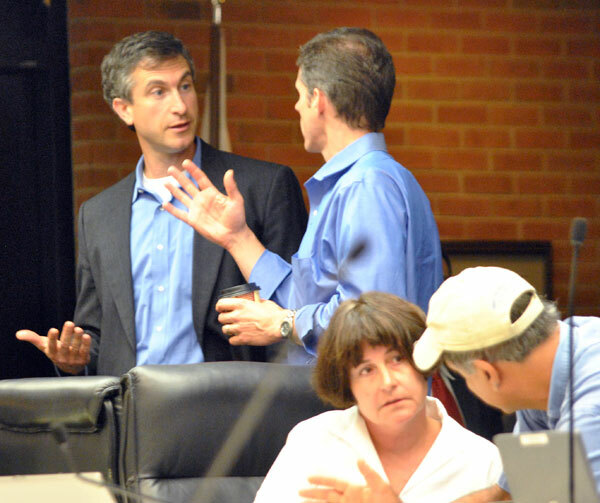 Stephen Kunselman (Ward 3) gets a briefing from Andrew McGill before the Aug. 20 council meeting. Their questions drew out several salient points from Kulhanek. He stressed that the city was under no obligation to move the navigational lights. City attorney Stephen Postema added his view that there’s no additional obligation to the city other than what is specified in the grant agreement related to the study. But Kulhanek did say, in response to a question from Stephen Kunselman (Ward 3), that with each grant agreement the city approved, came with it an obligation to operate the airport for another 20 years. Kulhanek explained the relationship between the two items on the agenda. One was a grant agreement. The second was the expenditure of the grant funds received under the first item. Mayor John Hieftje was keen to get some kind of assurance that this would be the end of the EA grant process. Responding to a question from Sabra Briere (Ward 1), Kulhanek indicated that the federal dollars derived from fees applied by the FAA to airline ticket prices. The local money derived from fuel fees and hanger rentals. He concluded that there were no general taxpayer dollars involved. Responding to a question from Mike Anglin (Ward 5), Kulhanek estimated that there are a total of 75-100 jobs at the Ann Arbor municipal airport. Responding to a question from Jane Lumm (Ward 2), Kulhanek estimate there are about 170 aircraft at the airport. Outcome: On the resolution for the grant contract, the council approved it, with dissent from Jane Lumm (Ward 2), Stephen Kunselman (Ward 3) and Sabra Briere (Ward 1). The resolution to expend the grant funds was also approved, with Briere dropping from the dissenters. Comcast asked that the city council approve its application for a franchise within the city. An existing franchise agreement with the cable company runs through 2017. Marcia Higgins (Ward 4) explained the implications of the vote on the Comcast franchise application. It was important that the council act at its Aug. 20 meeting, because Comcast had sent an application dated July 17, which the city and Comcast agreed should count as “submitted” on July 23. And based on a recent ruling in the U.S. District Court on a matter involving the city of Detroit, the city needed to make a decision within 30 days of July 23. A staff cover memo recommended rejecting the applications. Reasons include the fact that the existing franchise will remain in place through 2017. In addition, Comcast was taking the position that under a new agreement, it no longer had the obligation to allow the city to use parts of the firm’s institutional network that are essential to ensure public health and safety and other public services. A third reason given for rejecting the application is that the new franchise agreement would grant use of the city right-of-way, and it’s not clear that continued public access to all public, educational, and governmental (PEG) channels would be ensured. And finally, according to the staff memo, Comcast’s application is not consistent with a formal renewal process – because it did not reasonably purport to meet local needs; and the application is not consistent with an informal process that would require the public to have an opportunity to comment. Stephen Kunselman (Ward 3) led off deliberations by urging support of the resolution to deny the application. He wanted to make clear that by voting for the resolution, the council would be voting to deny Comcast’s application. He noted that the resolution had the support of the city’s cable commission. He said the resolution would give the city greater bargaining power. Marcia Higgins (Ward 4) stressed that voting to deny the application would preserve the city’s CTN (Community Television Network) channels – for the duration of the existing contract, which is 2017. She said those channels are very important in the city’s communication system. Tony Derezinski (Ward 2) ventured that there’s a complicated governmental relationship. It’s under the current state act, assistant city attorney Abigail Elias explained, that Comcast has submitted its application. She stressed that the city’s contract continues for another five years, according to its term, so the application by Comcast is premature, she said. Outcome: The council voted unanimously to deny Comcast’s franchise application. The council was asked to give final approval for the rezoning of two parcels acquired by the city of Ann Arbor to add to the Bluffs Nature Area at 1099 N. Main St., north of Sunset Road. The council had given its initial approval on July 16. 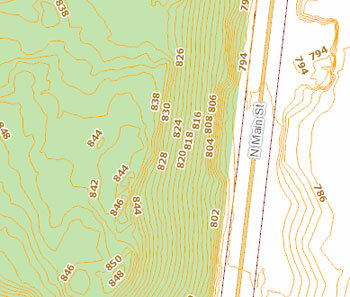 The steep slope of the Bluffs Nature Area as it rises from North Main Street is easy to discern in the two-foot counter topographic map. The city planning commission had recommended the rezoning at its June 5, 2012 meeting. A 1.12-acre parcel to the north of the Bluffs – connecting the existing parkland to Huron View Boulevard – is currently zoned O (office), and had been donated to the city by a nursing home near that site. A 0.57-acre addition to the south connects the existing parkland to Sunset Road and is currently zoned R4C (multiple-family dwelling). It had been purchased by the city from the Elks lodge, using funds from the open space and parkland preservation millage. Both parcels were given approval to be rezoned as PL (public land). The addition of the parcels will make entrance to the nature area easier. The current entrance off North Main Street is a challenge to pedestrians and cyclists, the road bears heavy traffic, and no sidewalks exist on the west side of the street where the nature area is located. Thomas Partridge described himself as a progressive Democrat. He criticized a lack of public access to facilities, buildings and land sites as required under the Americans with Disabilities Act. He called for using vacant land for affordable housing. He told the council that the rezoning should go back to the planning commission for further review. 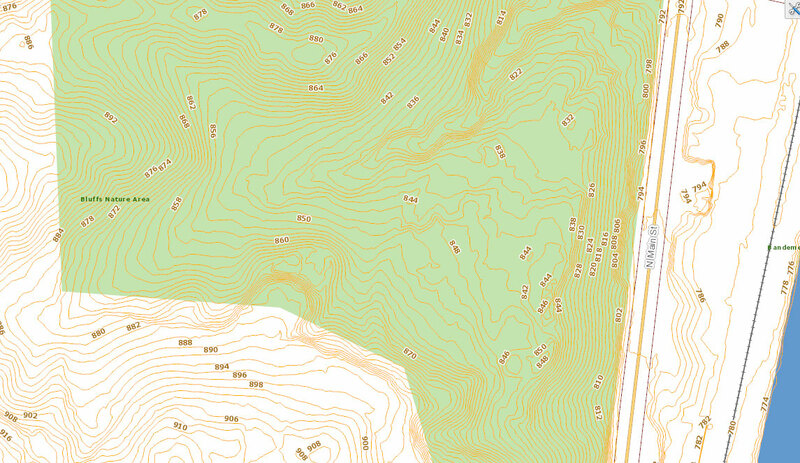 During deliberations, Sabra Briere (Ward 1) said it’s worth noting that Bluffs Nature area is peculiar in its terrain – it would be difficult to build on, which is partly why it’s a park and not a building site. It’s used heavily by people who navigate by foot or bicycle, and that’s part of its charm, she said. Outcome: The council voted unanimously to finalize the rezoning of the parcels being added to the Bluffs Nature Area. At its Aug. 20 meeting, the council was asked to take another step toward conversion of the land to city property – by giving initial approval to zone the property as PL (public land). Because a rezoning is a change to the city’s ordinances, the change will require a second council vote after a public hearing at a future meeting. During her staff report given to the city planning commission on June 5, 2012, city planner Alexis DiLeo said the property contains a single-family home that will be used by the community center to expand its operations. Eventually, the center would like to renovate the interior and build an addition to connect the two buildings, she said. The center is managed under contract with the nonprofit Community Action Network. The planning commission had voted unanimously to recommend the rezoning at its June 5 meeting. Outcome: Without discussion, the city council voted to give initial approval to the Eden Court rezoning. Nominations and appointments to city boards and commissions come at the end of every council meeting. Nominated at the previous council meeting for a renewal of their appointments to the board of the Ann Arbor Downtown Development Authority were Roger Hewitt, Keith Orr and Sandi Smith. Smith also serves on the city council, representing Ward 1. Stephen Kunselman (Ward 3) pulled out Smith’s nomination for a separate vote so that he could vote against it. He felt it’s inappropriate to appoint a city councilmember to the DDA, referring to the situation as having a “double-agent” on the council. He objected to the idea that someone with dual service on the DDA and the council could vote on a contract between the DDA and the city – because they’d get to vote twice. He called the two offices incompatible and said it was unethical for someone to serve in both positions. As for Kunselman’s point about contracts, the state statute on conflict of interest plays out somewhat counterintuitively – explicitly providing an exemption for contracts that are between governmental entities. Later at the same May 5, 2010 DDA board meeting, the issue considered by the board was analyzed not as a contract, but as a grant, and Lax asked Hieftje and Smith to recuse themselves from the vote. At the Aug. 20, 2012 city council meeting, when the council voted on Smith’s reappointment to the DDA, Jane Lumm (Ward 2) joined Kunselman in objecting. However, Lumm went to considerable lengths to stress that her vote was not about Smith individually. She noted she’d had the pleasure of serving on the DDA partnerships committee with Smith and she respected and admired Smith’s work. Her objection was about the philosophy of appointing a councilmember to the DDA board. Sabra Briere (Ward 1) noted that when Smith ran for city council in 2008 for the first time, she was already serving on the DDA board. Smith has chosen not to run for re-election to the city council this year. Her appointment to the DDA board, Briere concluded, is independent of Smith’s position on council. Mike Anglin (Ward 5) ventured that perhaps the council could have a larger discussion at a different time. He described Smith as having been very fair about things, so he supported Smith’s appointment. Hieftje indicated that he understood the argument that some were making, but felt it’s important to have someone on the DDA board who understands the big picture. He pointed out that Smith has just five more voting sessions as a city councilmember. Carsten Hohnke (Ward 5) felt that it’s good in general to have members of the city council as members of a larger board. It was not clear to him why the DDA board is different. Kunselman pointed out that none of the other positions that people had mentioned would typically engage in contract negations with the city council. The mayor is authorized to sit on the DDA board under the enabling legislation for downtown development authorities, he allowed. But even there, it would be possible for the city administrator to fill that slot instead of the mayor. Smith, for her part, took the comments from Kunselman with apparent good humor, telling him that if he’d like to change who sits on the DDA board, he should run for mayor. Outcome: The council voted to reappoint Sandi Smith (Ward 1) to the DDA board, over the dissent of Jane Lumm (Ward 2) and Stephen Kunselman (Ward 3). Other appointments were approved unanimously, without comment. Without discussion, an additional member was added to the Ann Arbor taxicab board – Michael Benson. The addition will allow the body to achieve a quorum of three out of five voting members for its meetings. It has not been able to do that since July 2012, when Tim Hull resigned after taking a job on the west coast. 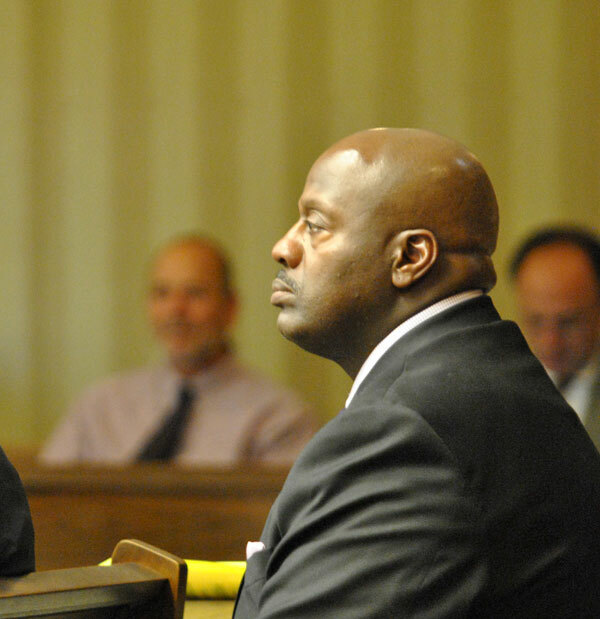 Benson was added to the board in a one-step confirmation process. Ordinarily, nominations to a board or a commission are first announced at a city council meeting, then confirmed by a council vote at a subsequent meeting. The taxicab board will now consist of Benson, city councilmember Stephen Kunselman (Ward 3), Tom Oldakowski, Tom Crawford (a non-voting ex officio member, as the city’s CFO) and Bill Clock (a non-voting ex officio member, as representative of the Ann Arbor police department). The taxicab board is responsible for administering the city’s taxicab board ordinance. [.pdf of taxicab ordinance] Application forms to be appointed to city boards and commissions can be downloaded and returned to the mayor’s office for consideration. Outcome: Michael Benson was unanimously appointed to the taxicab board. Every city council agenda contains multiple slots for city councilmembers and the city administrator to give updates or make announcements about important issues that are coming before the council. And every meeting typically includes public commentary on subjects not necessarily on the agenda. During the public commentary at the conclusion of the meeting, Kathy Griswold told the council she was there to address the most important activity for elected officials: the safety of citizens, especially children. She contended that the city was confusing an engineering problem with social policy. There are effective public policies like “share the road” or “complete streets,” but what we need is traffic engineering, she said. She called for the issue to be reviewed by independent engineers with the state. She asked the city attorney to consider the risk that’s being created when the city tells pedestrians that “they rule.” She warned against putting up posters telling children they have the right-of-way as pedestrians. She called that crazy, and called for an independent traffic engineer to evaluate the situation. After thanking the council for his appointment to the taxicab board, Michael Benson related what he’d seen while attending a recent academic conference in Munich – bike lanes separated from the right-of-way. It was amazing to see the number of bicycles there, he said. Relating his experience in Ann Arbor – trying to cross Huron Street near the University of Michigan campus – he’d witnessed three near accidents, both as pedestrians and as a driver. He suggested looking into driver education. Let us rid ourselves of the One Per Cent For Art ordinance once and for all. Good to see Thomas Partridge yet again. There are several things that bother me about the arts millage proposal. One is the heads-I-win tails-you-lose quality of it (for those who oppose the percent for art funding mechanism). Another is the lack of council deliberation on the details. This is an example of the poor decision-making mechanism that I complained about on my campaign blog. I know there was a two-week interim, but most councilmembers had this sprung on them full-blown with little opportunity to shape it. That is not a good way to make policy.